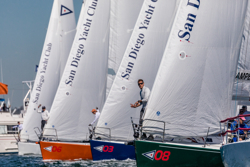 (San Diego, CA)- The International Masters Regatta will return to the San Diego Yacht Club on October 19-21, 2018 for a regatta with some of the greatest names in sailing. 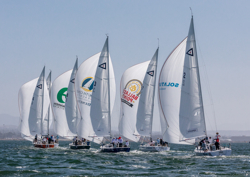 Legendary skippers from across the country are invited to a round-robin battle in supplied J/105s and will be vying for the title in the stadium of San Diego Bay. The 2018 International Masters Regatta confirmed skippers include Jon Andron, Julian Bingham, Chuck Driscoll, Richard du Moulin, Tad Lacey, Bill Menninger, Ted Moore, Dave Perry, Bill Peterson, Andy Roy, and David Gould. Anyone interested in watching the races can find them in San Diego Bay. The schedule of events for the sailors begins on Friday with breakfast, followed with racing and a dockside social in the evening. After Saturday Night’s racing, there will be a regatta banquet for participants and after racing on Sunday, the awards will be presented. In 2013, the perpetual trophy for the International Invitational Masters Regatta was gifted and dedicated by Malin and Roberta Burnham at the regatta banquet. The trophy is a beautiful original art piece created by Don Freedman of Nantucket Island and features a nautical inspired clock detailed with ships’ instruments. SDYC would like to thank our partners of the International Masters Regatta: Helly Hansen, YETI, Solid Sun Logistics and The Bay Club Hotel and Marina. For more J/105 Masters Regatta sailing information Add to Flipboard Magazine.